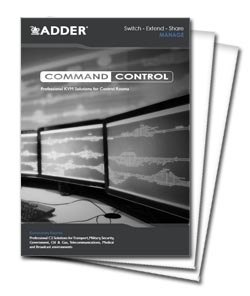 The AdderView Secure Digital AVSD1002 KVM Switch enables a monitor, keyboard and mouse, and audio to be shared between high and low security systems, sometimes known as red and black networks, and is designed carefully to prevent information flowing between computers or to the outside world via emissions snooping. The AdderView Secure design prevents sensitive data from leaking between ports, sensitive data leaking to the outside world and sensitive data from being stored in the device. Furthermore, the switch actively combat a range of potential leakage "threats". The AVSD1002 is designed to enable two computers in a secure environment to be controlled from a single high resolution KVM console using dual link DVI or VGA (via optional DVI-I to VGA adaper). Dual link DVI interface operates at full DVI bandwidth up to 2560 x 1600 @ 60Hz to ensure higher end applications that require high resolution or exact video quality to run smoothly. DVI interfaces have the added security advantage that randomizing the low order video bit can make snooping much harder. The hardware and software must agree before data flow is enabled. The switch constantly checks its own operation and will stop operating and flash its error light if an unanticipated event occurs. The AdderView Secure is heavily shielded with double shielding in critical areas to minimise the risk of eavesdropping equipment being able to pick up signals from the equipment. The keyboard and mouse processor is powered down and reset at each switchover to thwart shared RAM leakages. Separate memories hold the num, caps and scroll states and are only accessible when the relevant channel is selected. All data buffers are actively cleared once they have been used. The USB ports will only support keyboards and mice and other devices, such as USB storage drives, are actively prohibited. The circuitry for each port is independently powered from the USB lead. Power line signaling is therefore blocked because different port circuits don't share the same power feed. High crosstalk isolation ensures that less than 1/1000th of any signal from one computer is presented to the input of another computer due to electrical crosstalk. One-way data paths ensure that data isolation does not rely on trusting microprocessor software, but is instead assured by hardware and prevents a hidden software weaknesses that could potentially cause data leakage. A unidirectional structure also protects against timing analysis or forced malfunction attacks and prevents computers influencing the operation of any common circuitry. Data isolation is assured by hardware and so is not compromised by any changes to the microprocessor software. Microprocessors use one time programmable memory so flash upgrades are not possible. Digital or analogue video, Simple channel selection, Tamper evident case seals, Keyboard and mouse hotkey switching is banned from the design, etc. Hardware Compatibility Supports PC, Sun, Apple, RS/6000, Alpha and SGI-computers with USB keyboard and mouse interfaces and either VGA or DVI video interfaces. Software Compatibility All known software and operating systems including Windows (all), DOS, Linux, Unix, BSD, Sun OS, Solaris, Mac OS, NetWare etc. AVSD1002 is also known as the AVSD1002-US and AVSD1002-USA.